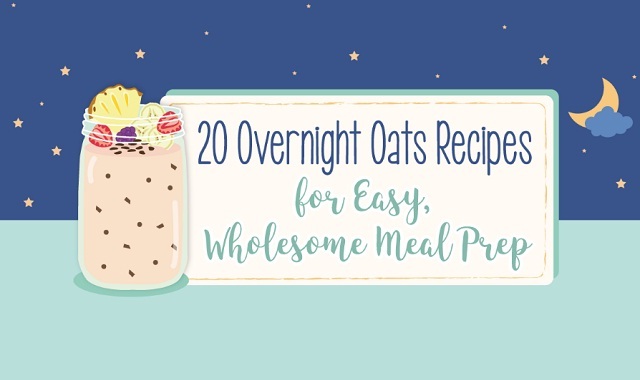 20 Overnight Oats Recipes for Easy, Wholesome Meal Prep #infographic ~ Visualistan '+g+"
Easy, fast, convenient, and cheap, overnight oats are all the rage right now – especially for night owls! If you don’t want to mess around in the kitchen in the morning but still need a hearty breakfast to get you going, this is the simple solution that’s actually healthy for you. Combining steel cut oats, any milk of choice, and many different toppings (from fruit to nuts to chocolate), you can pack your fridge with mason jars and grab a glass on the go. TitleMax has compiled twenty overnight oats recipes for wholesome meals, ones that can go from the extremely healthy (like cocoa nib and pomegranate) to the almost dessert-worthy (like delicious cookie dough)! These breakfasts might also make a lovely dessert alternative, as they hit the spot with nowhere near the same amount of calories. Try some of them out and see how quick and easy it is to pull together. Maybe you’ll get in a groove and overnight oats will become a new part of your morning routine!